With my blog reading that is… I can’t believe how the sewing blogosphere has exploded over the past year. Every time I turn around, there’s a new sewing blogger that I want to check out. I think my google reader has over 250 subscriptions. I am so behind in reading and making comments, it’s scary. And to put salt on the wound, I am blocked from commenting on blogs at my day job, so I am forced to choose between blog commenting or sewing in the evenings. I think you know which one I’m choosing, right? How do you handle all of your blog reading? I feel your pain! There are so many interesting people doing inspiring things. You are right though, reading blogs all the time can really cut into one’s sewing time! But it is such an enjoyable way to while away an hour…or two! Okay…if you are treading then I must be sinking! I don’t know what has happened to me in the last 6 mos. There was a time that I sewed, blogged and read blogs…now I can’t fit any of it in my day like I would like! I guess it is life! I tend to visit my favorites on a daily…weekly jaunt. And well, there hasn’t been much sewing so I have nothing to blog about…. I always enjoy your posts…keep it up!! Hope that helps, somewhat, and don’t let it feel like homework! I used to spend lots of time at work blogging – reading blogs, commenting and writing my own blog. Then I decided I really should be doing what they’re paying me for and now I can’t keep up! 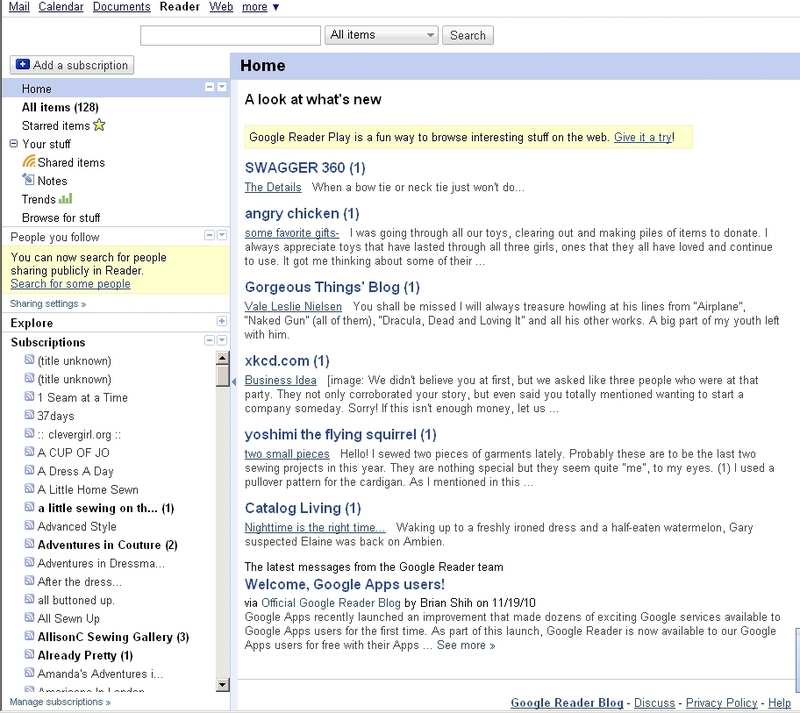 I quickly scan through Google Reader, but I feel like I’m taking full advantage of all the blogs out there. For me, blog friends are like real friends – there are some you see all the time, some you catch up with regularly and some you only manage to get together with once and a while. There’s a whole lot of reasons why people fall into different categories and that’s just the way it is. I used to blog much more frequently – but when I realised how much time putting a post together took, I thought to myself that I’d rather save it for commenting on other’s blogs or making stuff myself. At the end of the day it comes down to priorities – what gives you the most pleasure and sense of reward ? I follow about 30 sewing blogs. They are my igoogle home page. I check every morning for new posts, about 15 minutes. I make mental notes on those that will require a closer read and try to do that at night when I get home from work. 250 sewing blogs? I’m checking your blogroll to see who I need to add. I only read a few blogs but yours is one of them. Rather than a blog reader of some kind. I keep a Word list of blogs and limit the length, adding and deleting what works. I’m lucky to have an hour each morning to click through and read. It’s become such a part of my routine that it’ll be an adjustment when that changes… which it will… since I’m looking for a job. ANYWAY… my point was that limiting the length of the list makes me very picky about what I read and keeps the content relevant. LOL! That’s it! I had over 300 around Thanksgiving! Playing catch up isn’t easy but I try to keep up with it. Don’t overwhelm yourself. I find that skimming some information is best. Besides I don’t comment often either. That saves lots of time! Good Luck catching up! I have 56 more to read after yours! I use Google reader too. I skim through blogs when I have some dead time at work, but I don’t feel obligated to keep up with reading blogs. At night I sew, so I don’t go online either. Also since I work in IT/web development, I rarely want to be on the computer when I’m home. I’m telling myself that I can’t read everything and can’t comment on all the posts I’m reading. Like some said, I too have learned to prioritize. Sometimes I take a break from work (I work on my own and can define my own working hours) and read a few posts in the reader and occassionally comment and then go back to work. I’m trying not to spend too much time on the internet (but it’s hard).